Great Lakes / St. Lawrence / Canadian Shield population. 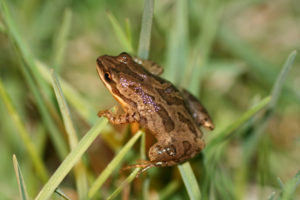 Small (3 cm), smooth skinned tree frog that varies in colour from greyish-green to brown. Dark stripe through the eye and three dark stripes down the back. Whitish line along the upper lip. Feeds on beetles, flies, mosquitoes and slugs. Breed early in the season beginning in late March and generally breed in areas where the water is at least 10 cm deep. Rasping breeding calls “cre-ee-ee-eek” sounds like a thumbnail drawn over the teeth of a small comb. Remain in the tadpole stage for approximately two months and live no more than a year as an adult. Secretive and rarely seen outside of breeding season. Forage for food in fields and open forest. Hibernate beneath leaf litter, logs or underground. Meadows and forest openings around vernal pools (typically are dry later in the season and do not support fish).  Loss of breeding sites and effects of pollutants such as herbicide and pesticides. 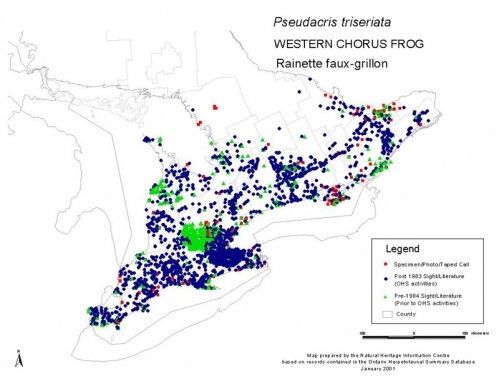 Learn the call of the chorus frog and listen for them in early spring. Please report the areas where you hear them. Vernal pools are important habitat for many amphibian species. If you have them on your property, please try to leave them in their natural state.